Boris and the Saltlicks "CACTUSMAN VERSUS THE BLUE DEMON" ©2006 Frogville Records FVR0038 Review by Lucky Boyd Here's the next 'thang' from Boris and the Saltlicks, and it's a big 'thang.' From the opening "Volcanic Wind" you'll be entranced by Boris McCutcheon's laid back 'cryptocism' and a comfortable delivery that keeps you coming back. You'll have to hear the entire disc a couple of times before you begin to understand McCutcheon's genius, but it becomes more evident with each passing listen. Before you know it you'll be a cult-like fan of this honorary Texan. A highlight of the album is the co-write with Steve Almond, "Chicken Man" that blends true rock instrumentation with a funk feel that you'll play over and over. To prove they can still get it done on the blues side, listen to "Don't Get Weird." An entertaining disc at every turn, get your copy today. 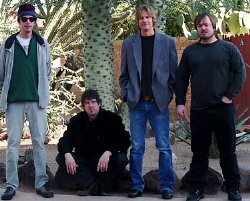 Boris and the Salt Licks Boris McCutcheon "WHEN WE WERE BIG" ©2003 Cactusman Records Review by Lucky Boyd Sometimes we like our next door neighbor as much as we like ourselves. When that happens, we introduce you to acts like Boris and the Salt Licks. Boris McCutcheon wasn't born in Texas, nor does he live here. Alas, he's a neighbor, spending his time around Santa Fe, New Mexico and parading into Texas for shows as often as he can. Texas has embraced McCutcheon in such a way that he is becoming more Texan each day. His music is already there. Mixed influences and attitude make a music cocktail that tastes genuinely Texan. With that, here's a toast to this band of blues masters, with their alt-rock dynamics and their folk-rock influences. The vocal work is solid as McCutcheon's quasi-lazy style of delivery hits the mark on every track. Well arranged and delivered, this 2003 release is a gem. Can't wait to hear the next thing from Boris and the Salt Licks. If you're out near Santa Fe, or Salt Lick City as it should be known, catch a show if you can. If you do, say howdy to our neighbors. my Genre: Blues Folk Rock my Reviews: 0 Review Read It! Add a review!